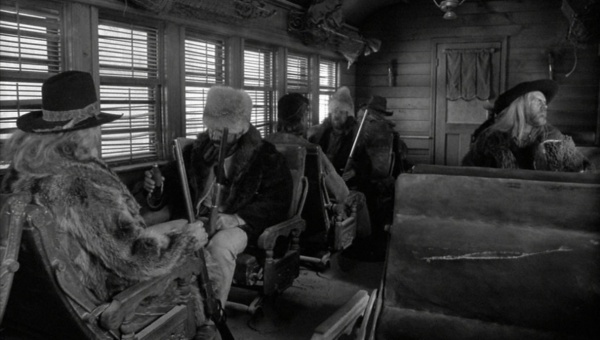 Some of the buffalo hunters on the train carry Winchester Model 1873 rifles. Marvin Throneberry (Jimmie Ray Weeks), a U.S. Marshal tracking Blake, also carries a Model '73. 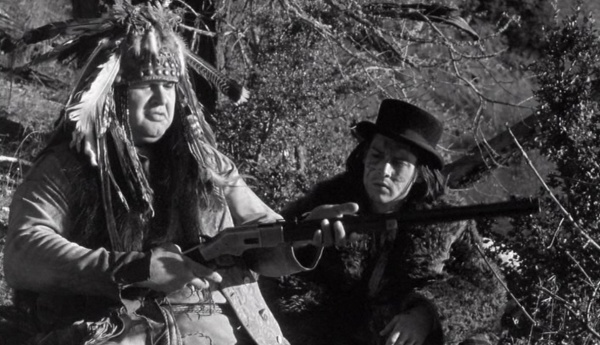 A buffalo hunter sits on the train with his Winchester '73. 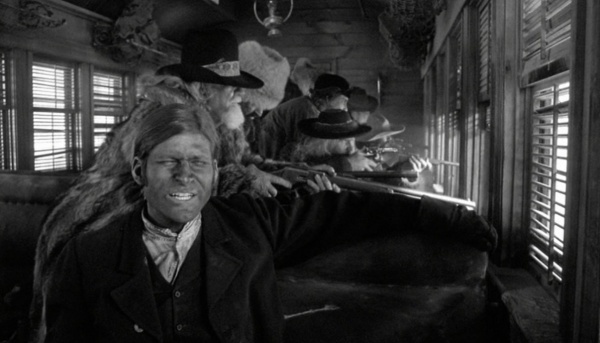 Buffalo hunters behind the train fireman (Crispin Glover) fire Winchesters out the window. 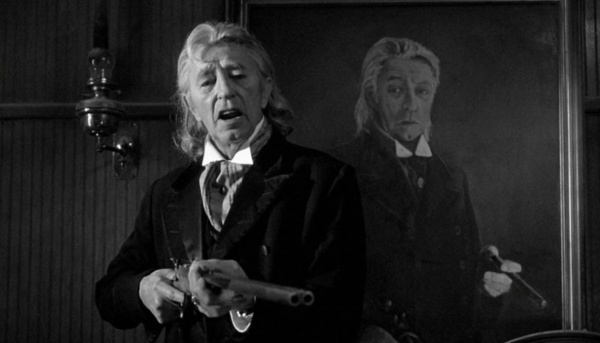 A man in the street in Machine looks at Blake with a Winchester over his shoulder. U.S. Marshals Lee Hazelwood with a Winchester '66 and Marvin Throneberry with a Winchester '73. 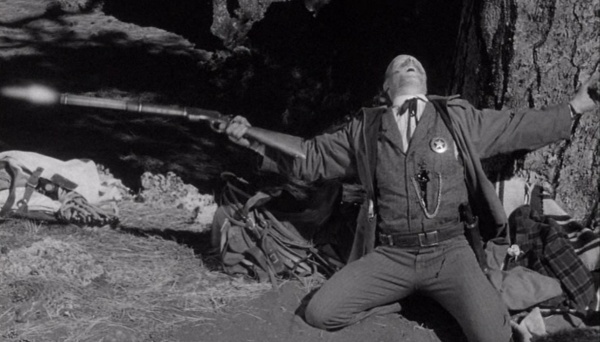 Marvin accidentally fires his Winchester, hitting Lee in the stomach, when he is shot by Blake. 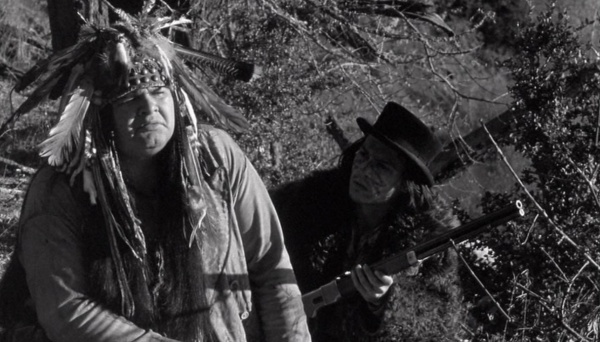 Several characters, including the buffalo hunters and British soldiers (in Nobody's flashback) carry Sharps Carbines. 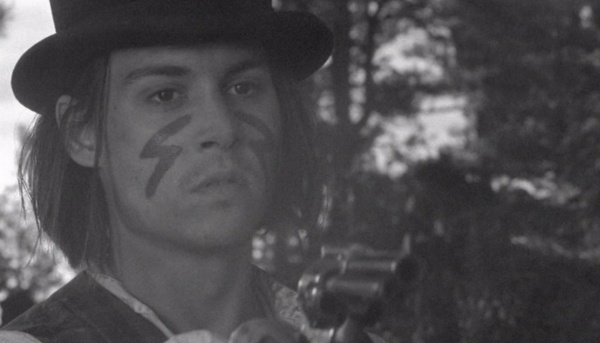 A buffalo hunter can be seen firing his Sharps in the background. In Nobody's flashback, the British soldiers who kidnap him have Sharps rifles. 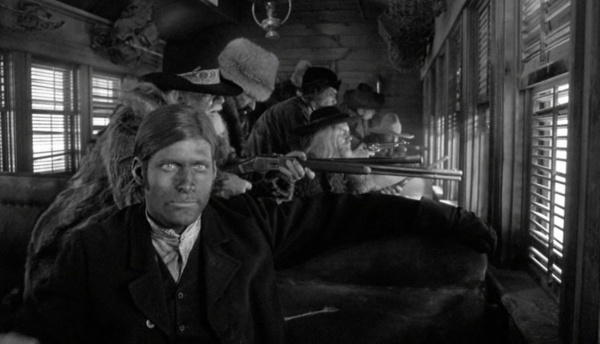 A shotgun and a Sharps rifle are visible on the wall behind the trading post missionary. 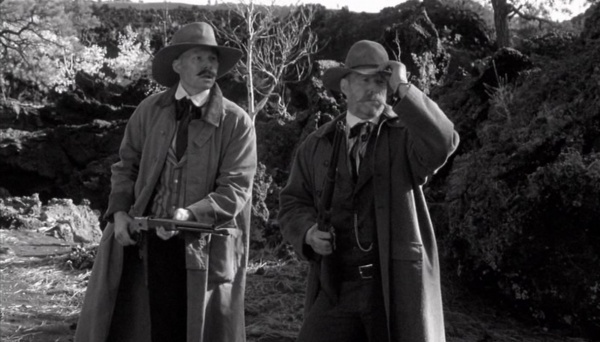 The Trapdoor Springfield 1873 Carbine appears to be the rifle carried by Benmont Tench (Jared Harris). 1873 Springfield Trapdoor Carbine - .45-70 Cal. 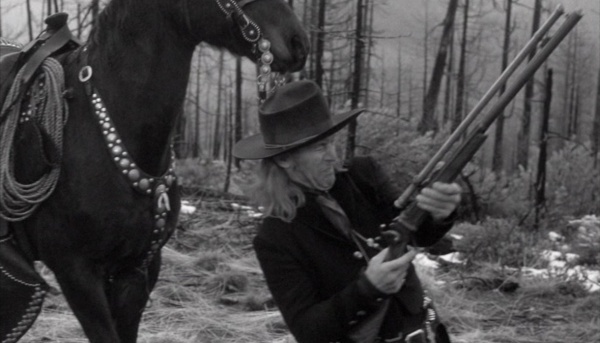 Benmont Tench aims his Springfield Carbine at Big George. 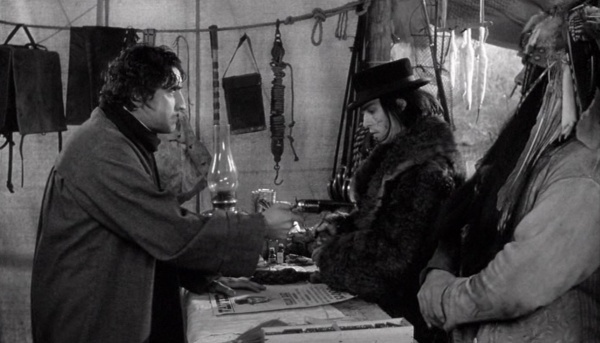 Bounty hunter Conway Twill (Michael Wincott) keeps a Henry 1860 as his long gun. In front of Conway is his Henry 1860, leaning against the desk. 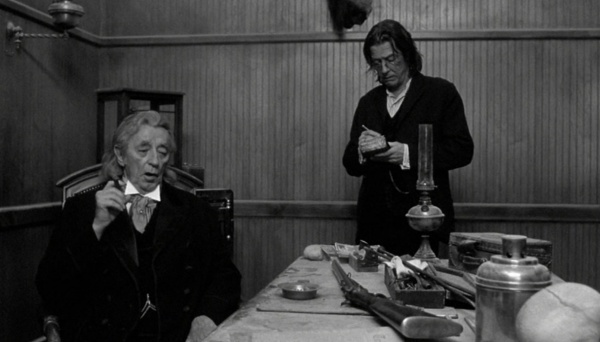 Wilson's long range Sharps rifle leans on the desk in front of him. 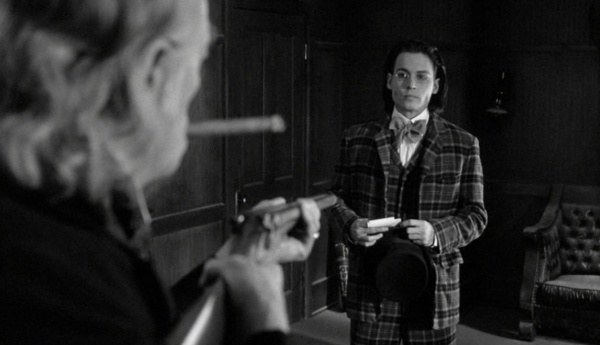 Cole Wilson (Lance Henriksen) carries a Sharps 1874 Long Range with a telescopic sight. Sharps 1874 Long Range rifle w/ 34" barrel, Vernier peep sight, and Lyman Beach front sight - .45-70. Wilson checks his Sharps rifle. 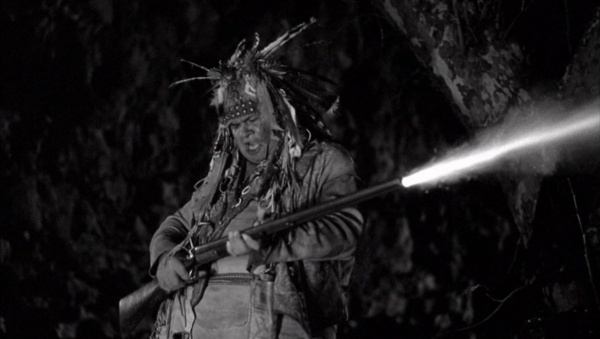 Wilson grabs his Sharps off his horse after being shot by an Indian arrow. U.S. 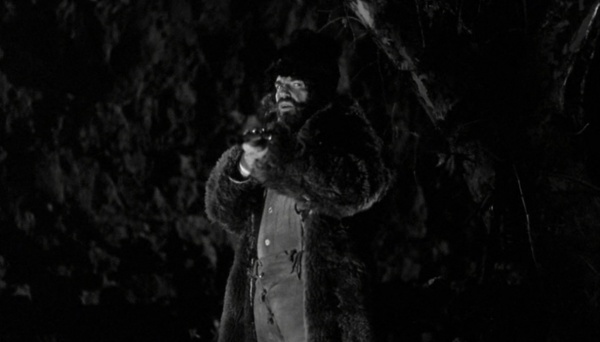 Marshal Lee Hazelwood (Mark Bringleson) carries a Winchester 1866 "Yellow Boy" Rifle. 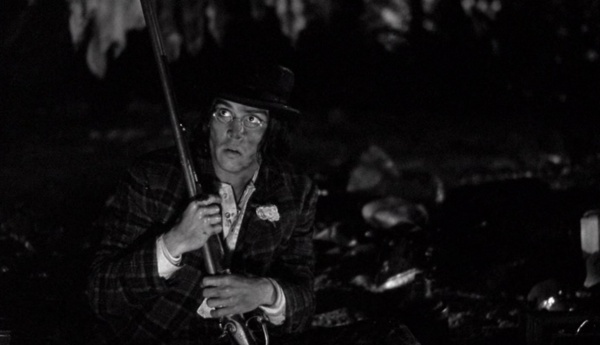 Blake (Johnny Depp) later takes this rifle and, after killing another man with it, offers it to Nobody (Gary Farmer), who fires it in the final scene. Winchester 1866 "Yellow Boy" Rifle - .44 RF. The U.S. Marshals with their Winchesters. 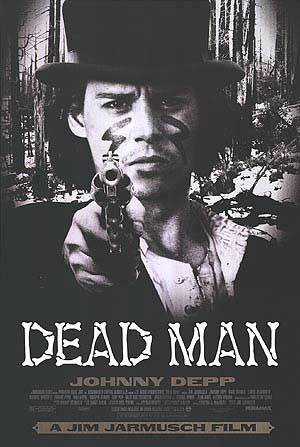 When Nobody comments on Blake's "new weapon", Blake tells him he got a "Winchester" that he took off a "dead white man". Nobody takes Blake's Winchester Yellow Boy. 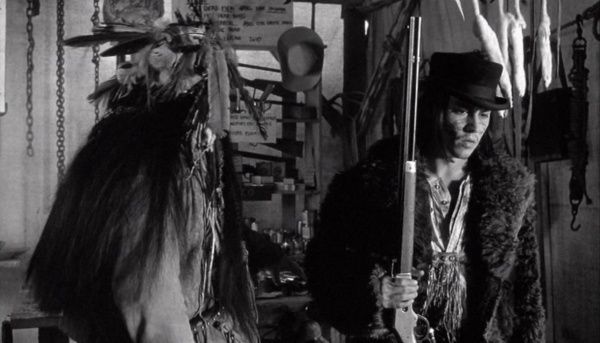 Blake with the Winchester '66 inside the missionary's trading post. 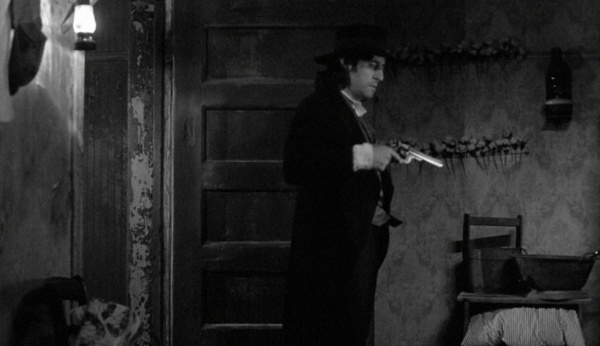 The man being "serviced" in the alley (Gibby Haines) when Blake first arrives in Machine aims a Colt 1860 Army at Blake. 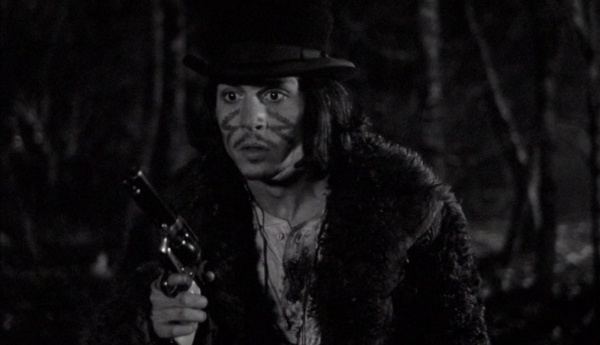 Johnny "the Kid" Pickett (Eugene Byrd) also carries two Colt Army revolvers. The man draws his Colt Army. The man aims at Blake. 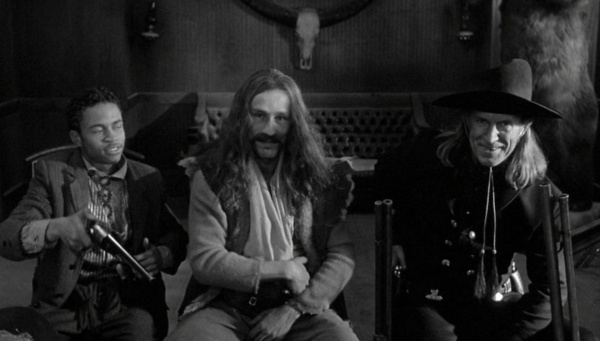 The three bounty hunters practice drawing their revolvers inside Dickinson's office. Johnny is on the far left with a Colt Army. 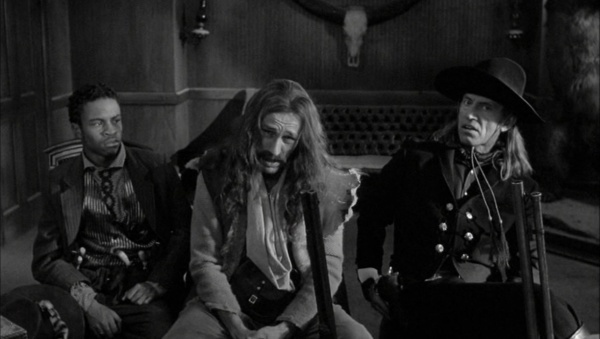 Johnny holsters his Colt Army inside Dickinson's office. 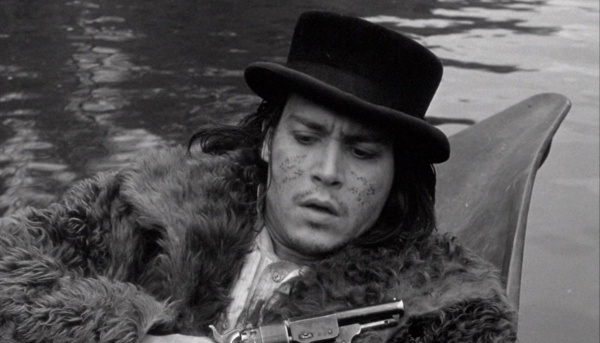 William Blake (Johnny Depp) discovers a blued Single Action Army Quickdraw model under Thel Russell's (Mili Avital) pillow, which she promptly places under her pillow. 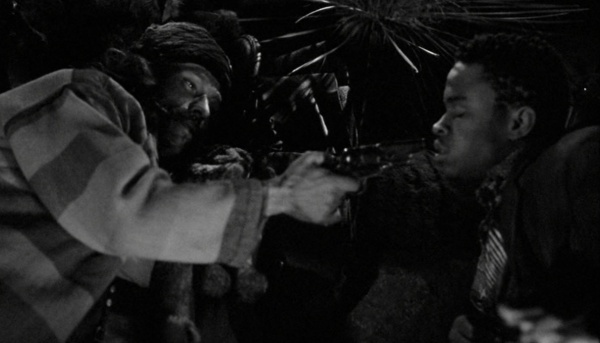 After using the SAA to shoot Charlie, Blake takes it and carries it through the rest of the film. Bounty hunter Cole Wilson (Lance Henriksen) carries a nickel Quickdraw SAA. 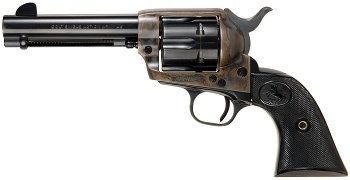 Colt Single Action Army w/ 4.75" barrel, case colored and blued, referred to as "Quick-Draw" or "Civilian" model - .45 Long Colt. Blake looks at Thel's revolver, which she warns him is loaded. 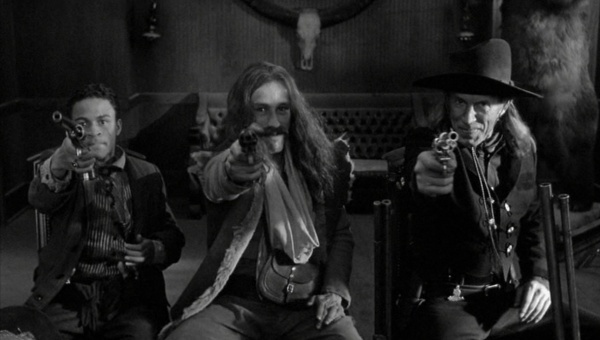 The three bounty hunters practice drawing their revolvers inside Dickinson's office. Wilson is on the far right with his nickel SAA. Wilson draws his SAA on Conway to shut him up briefly. Blake looks at the SAA in his hand when Nobody tells him that it will replace his mouth. Blake fires at the fur traders. Blake shoots U.S. Marshal Lee Hazelwood, asking him if he's familiar with his poetry. 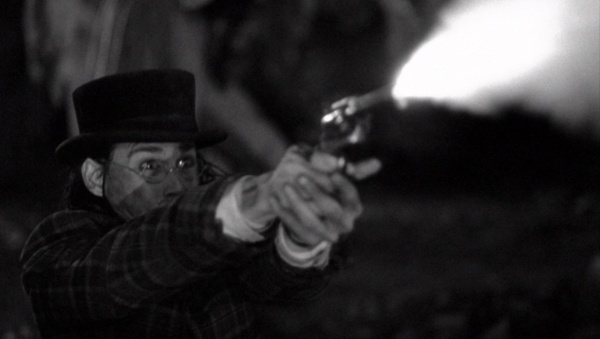 Charlie Dickinson (Gabriel Byrne) shoots Thel Russell with a blued Smith & Wesson Schofield. The bullet apparently passes through Thel, killing her, and enters Blake's chest next to his heart. Charlie draws his S&W Schofield. 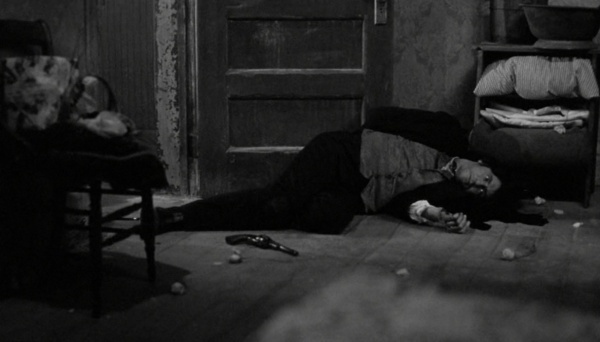 Charlie's Schofield lays on the ground next to him after Blake shoots him in the neck. 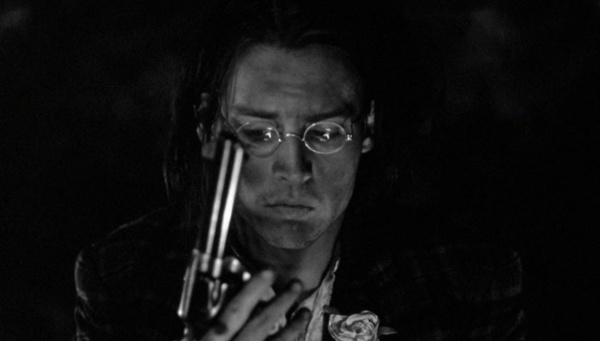 Bounty hunter Conway Twill (Michael Wincott) also carries two customized Colt 1860 Army revolvers cut down to a more compact "Pocket" size. 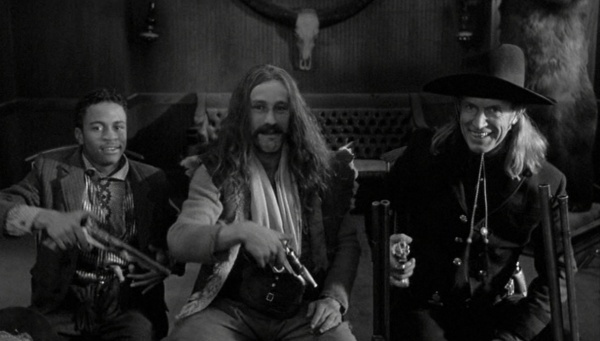 The three bounty hunters practice drawing their revolvers inside Dickinson's office. Conway is in the center. Conway reholsters his Colt Army Pocket. 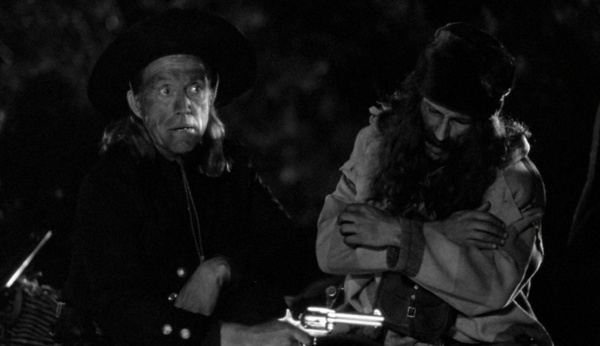 Conway holds one of his Colt Army Pockets on Johnny. 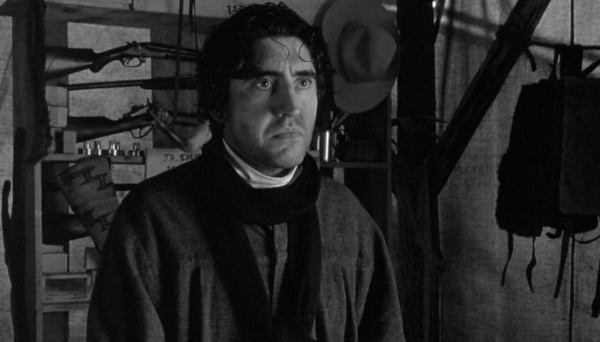 The trading post missionary (Alfred Molina) attempts to draw a Colt 1849 Pocket but Blake knocks it away from him and shoots him with his SAA. 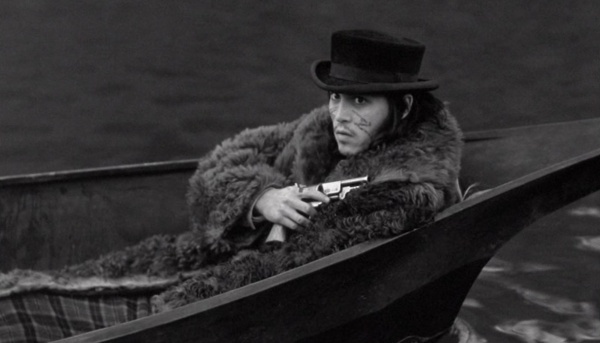 Blake then takes the Colt 1849 Pocket and holds it in the canoe as he and Nobody float away. The missionary draws his Colt Pocket on Blake. 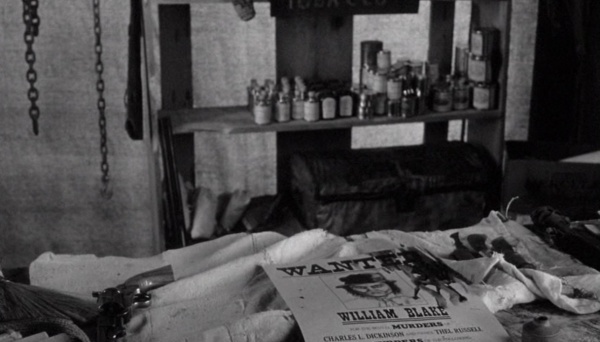 The missionary's Colt Pocket sits on the desk next to Blake's bloody wanted poster. Blake inside the canoe with the Colt Pocket. Blake with the Colt Pocket. 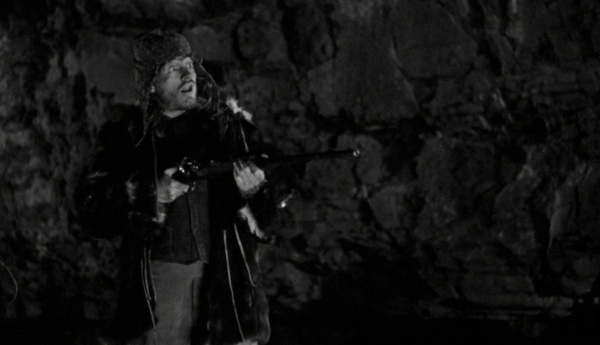 John Dickinson (Robert Mitchum) carries a double-barreled shotgun with exposed hammers while inside his office. 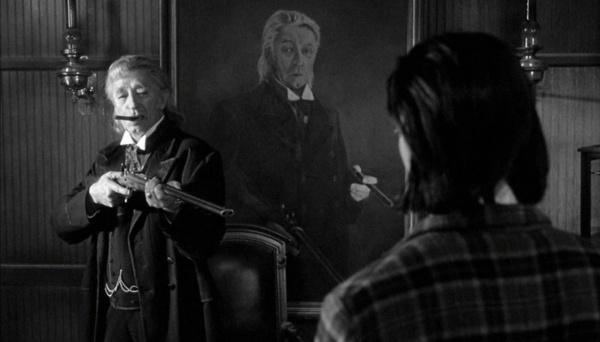 Behind his desk is a portrait of him standing with his shotgun as well. 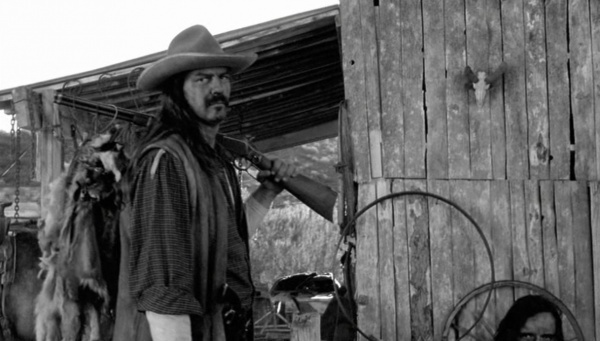 "Big George" Drakoulious (Billy Bob Thornton) also has a double-barreled shotgun, which Nobody (Gary Farmer) takes after slashing his neck. 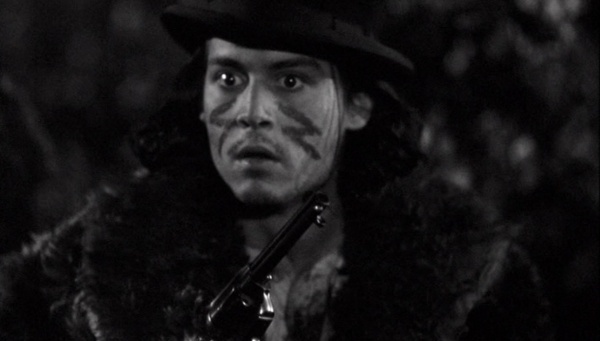 Nobody then tosses the shotgun to William Blake (Johnny Depp). 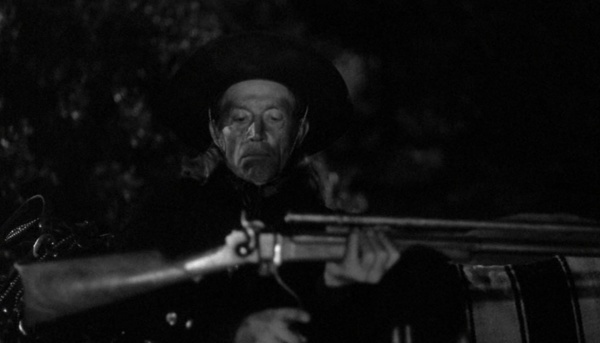 Dickinson holds his shotgun on Blake. 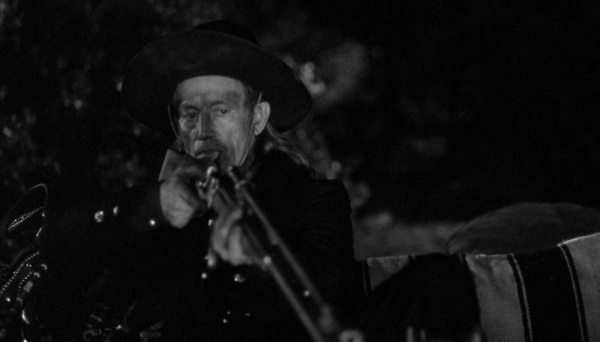 Blake stares down the barrels of Dickinson's shotgun. Dickinson sets the shotgun on his desk. Big George aims his shotgun at Blake. Nobody fires the shotgun as he handles it. 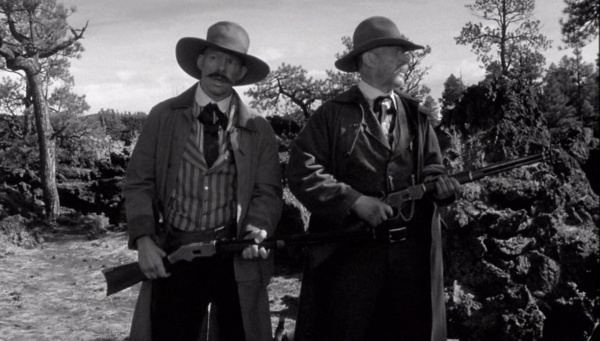 Blake holds Big George's shotgun.